At a distance of 130 km from the city of Bengaluru, Shivanasamudra is a well known waterfall which is located in the Mandya district. Shivanasamudra translates to Shiva's Sea, which is a segmented waterfall with several parallel streams forming adjacent to each other. 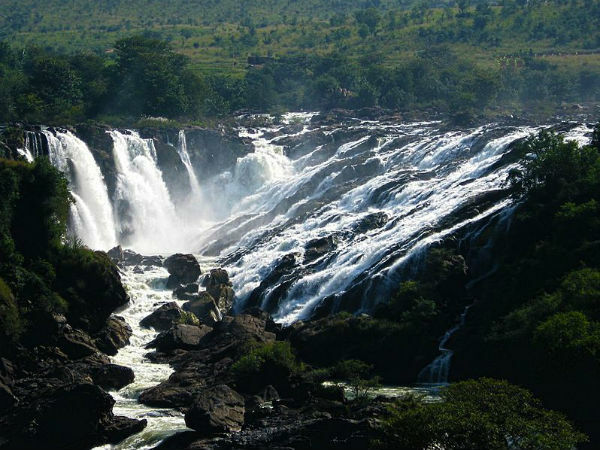 The waterfall is formed by the river Cauvery. Shivanasamudra is an island town which divides the waterfall into two segments of Gaganchukki and Bharachukki. One can also find a group of ancient temples which are located near the waterfalls. Shivanasamudra is home to the first hydro electric power station in Asia which was established in the year 1902. By Air: The nearest airport is the Kempegowda International Airport in Bengaluru which is approximately around 167 km away from here. Those who want to opt for Route 1, it would take you approximately around 3 h to reach Shivanasamudra, via NH 209. The route takes you through the well-known towns of Kanakapura, Malavalli, etc. The roads are well-maintained, which helps one to cover the distance at a good pace and the destination is about 135 km through this route. If you opt for Route 2, it would take you approximately 3.5 h to cover a total distance of 138 km from Bengaluru to Shivanasamudra, via NH 209. On Route 3, it would take you around 4 h to cover the distance of 175 km, via Kunigal-Maddur Road to reach Shivanasamudra. Turahalli forest, which is considered to be the only surviving forest in the city is located off Kanakapura Road. The forest is popularly known as Karishma hills. One can enter the area from the southern direction and enjoy the peace and quiet atmosphere of the greenery. The vegetation here is very sparse and comprises mostly of tall eucalyptus trees. Birdwatchers come here to spot a large number of avian species such as peafowls, mynahs and much more. The Krishna Lila theme park is a beautiful cultural complex which is being set up atop the Vaikuntha hill on the Kanakapura road. The complex is a fusion of traditional temple designs along with modern architecture, with two temples on the ground level. The hillock gives you a 360 degree view of Bengaluru and is expected to be completed by the end of 2017. The hillock has the two shrines opened up for the visitors. The theme park is a venture of ISKCON. Founded by Sri Sri Ravi Shankar, The Art of Living Ashram is located on Kanakapura road. The ashram is spread over 65 odd acres of land. The Art of living foundation was set up here in 1986 amidst the peaceful and verdant grounds. The main attractions here are the artifical lake, the Vishalakshi Mantap, which is the central meditation centre, along with numerous yoga programmes. At Shivanasamudra, the river Cauvery splits into two which results in the formation of an island. Both the branches flow through deep gorges, which eventually join together to form another magical waterfall. The Shivanasamudra waterfall is often known as the Niagara of Karanataka as the appearance resembles the Niagara. On the island, one can find a temple dedicated to Ranganatha Swamy, who is known as Madya Ranga here. There are two more well known Ranganatha temples on the banks of the river Cauvery. The first one is at Srirangapatna, which is known as Adi Ranga and the second one is at Sri Rangam in Tamil Nadu and is known as Anthya Ranga. Another temple located here is the Sri Someshwara temple, which is considered to be older than the Ranganatha temple. Adi Shankaracharya is believed to have visited this temple and established a Sri Chakra. About 35 km from here is Talakadu. The historical town is well known for its temples and also for its desert-like appearance. The most well known temple amongst the lot is the Vaidyanatheshwara dedicated to Lord Shiva.